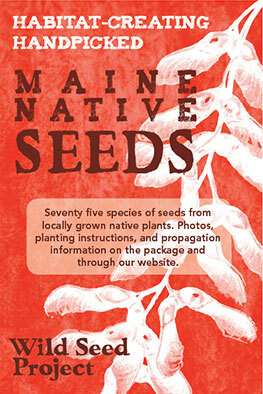 Spring is a great time to taste some of Maine’s native plants that have edible leaves and shoots. Below are species that can be planted in your home landscape, transforming your experience with native plants beyond their ornamental and wildlife value to the gastronomic. This information is not intended as a field guide to foraging wild native edibles. My aim is to take the knowledge found in a foraging guide about our edible wild plants and combine it with the act of gardening. This is conservation through cultivation. It is important to recognize that many of our native greens are much slower growing than the cultivated vegetables and edible weeds that sprout up quickly around our farms and disturbed areas. Most of these slower growing natives cannot sustain commercial harvesting by foragers; their life cycles are just too slow for the number of humans out there exploiting these plants. For healthy populations of these plants to survive, we need to move beyond the dream of returning to the hunter-gatherer lifestyle (as appealing as it is to many of us), and include more of these species in our landscapes. 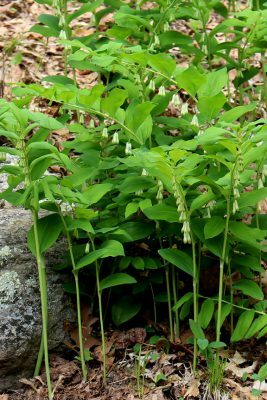 These edible natives are perfect for home gardeners and small farms. If you hope to be eating these plants well into the future, plant some, either by seed or sourced from nurseries that are propagating their stock, not wild collecting. In a couple years, you could be foraging in your own back yard. I have divided the species below by their growing requirements. Correctly siting these plants in your landscape will give them the best opportunity to thrive and produce an abundant harvest. Below are some of my favorites, but there are many more than what I have included. They are listed roughly in order of harvest time. This delicious spring green is one of many native wild onion species. A true spring ephemeral of the deciduous forest, tender green strap like leaves emerge in early spring to take advantage of the leafless tree canopy. In less than 2 months the leaves go dormant; by mid-summer the flowers emerge. This plant has a very slow life cycle, so build up a large population before harvesting above ground greens that are delicious sautéed. Read more details about cultivating this plant. 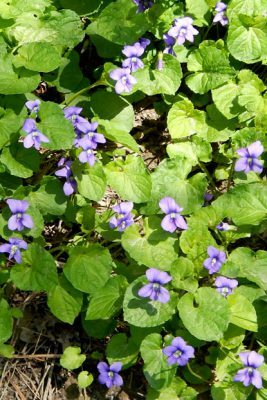 Violets make charming garden plants emerging in early spring with edible young leaves and flowers that are delicious in salads (and beloved by children). One plant, if happy, will quickly spread by seed and eventually give you plenty of spring nibbles. This is the familiar fiddlehead that appears in spring markets throughout the state. 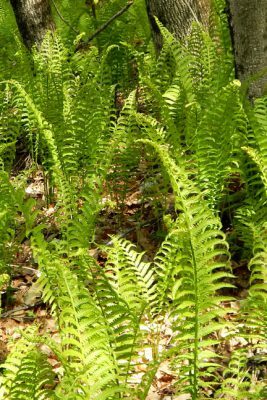 In late spring the fronds unfurl into large dramatic vase shaped ferns. Grow in dense to light shade in moist fertile soil. The patch will expand over time so give it plenty of room. In the 3rd year of establishment you can begin your harvesting the young fiddleheads. They can be cooked or pickled. Harvest the large leaves within a week of emerging in May. Chop and sauté like chard or add to curries and soups. This aster is very easy to grow from seed and expands to a large colony of low growing foliage with attractive heart shaped leaves. In late summer the plant blooms with white to pale lavender aster flowers that attract many pollinators. This is one of the fastest growing native greens that can give you an abundant harvest every year. This species is available from our Seed Sale. One of our native wood lilies with edible shoots. Harvest at 6-8 inches tall and prepared like asparagus. This species is slow growing and our wild populations should be protected. It can be grown from fresh seed, and a handful of seeds will, in 4-5 years, grow into a nice patch for home harvesting. A beautiful shade garden plant. 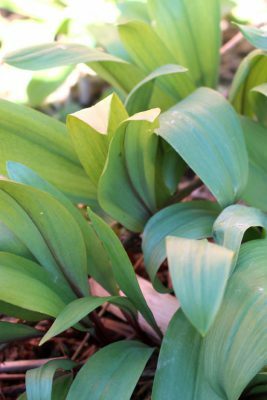 Another woodland plant in the lily family, this dramatic species is also slow from seed but does reproduce vigorously in a garden from mature roots within 5 years of establishment. Harvest at 6-8 inches tall and peel the bitter outer sheath before cooking like asparagus. An added bonus is that bumblebees and hummingbirds pollinate the flowers. 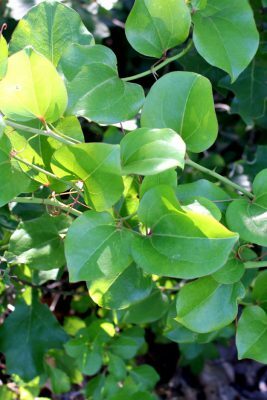 A large woody vine that grows on woodland edges and shady streamsides scrambling over shrubs and up large trees. 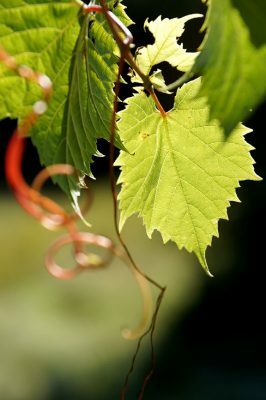 Plant the vine on a large arbor to manage its growth for ease of harvest. Pick the edible leaves within a week of unfurling in late spring and sauté or preserve in brine for wrapping around savory fillings. In the fall enjoy the flavorful but tart fruits in jams and juices. 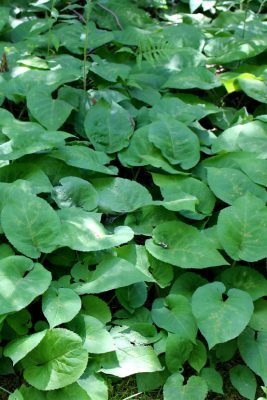 A vigorous perennial vine that scrambles over large shrubs at the woodland edge. Not a plant for small landscapes, it produces abundant and delicious young shoots that can be cooked like asparagus. Additionally, the young leaves and tendrils that can be sautéed like spinach. If you have a large property, greenbrier offers a tasty harvest on the edge of a field where other crops can’t grow. Birds relish the late summer blue-black fruits. Slow to propagate from freshly harvested seed but worth the wait. Plant in full to part sun with moist soil, or directly into water. A large dramatic biennial that self sows abundantly. The tender stems of angelica can be cooked like a vegetable or candied with sugar for a treat. 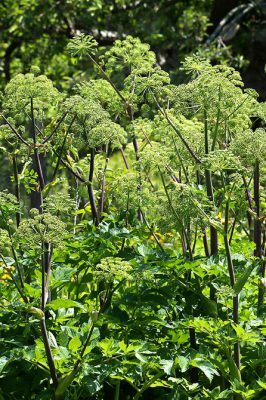 Look in European herbals for ideas for many interesting ways to use angelica. Our American species also has many medicinal uses. The young rolled leaves or unopened flower buds can be harvested and cooked. 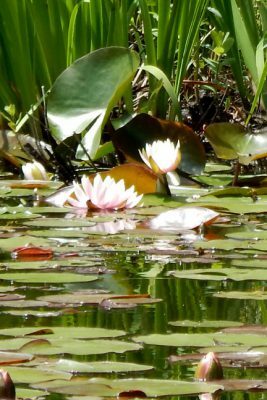 This plant grows to a large colony in a pond. Can be planted in a large pot in a water trough or in a water garden. The young leaves can be harvested as they first immerge above the water. Chop raw in salads or sautéed like chard. 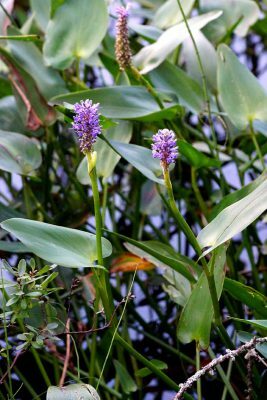 Can be grown in a water garden, in a large pot in water, or natural pond. 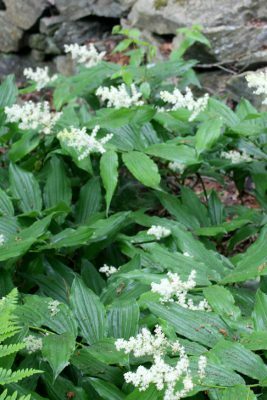 One of our most useful native plants, with all parts including the roots, shoots, leaves, flowers and pollen edible and delicious. As a vegetable, harvest the young shoots from below the water level, steam or sauté and serve with hollandaise sauce. Later you can pick the green inflorescence to steam and eat like corn on the cob. 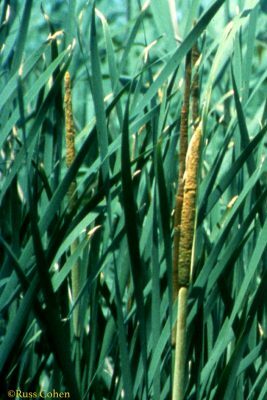 This plant could potentially be an alternative crop for small farmers in wet meadows, instead of draining these fields they could converting it to a perennial cattail bed. There are many excellent books on edible native plants. I like the Peterson Field Guide to Edible Wild Plants for its comprehensive coverage, Wild plants of Maine: a Useful Guide by Tom Seymour, and Wild Plants I have known and Eaten Russ Cohen. Some of the permaculture books also cover native perennial vegetables. Read Perennial Vegetables by Eric Toensmeier. 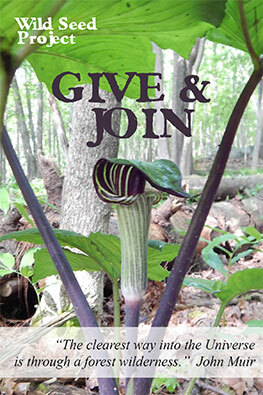 Use your desire for unusual delicious foods to motivate you into planting these natives right outside your kitchen door. 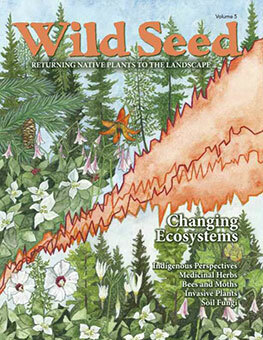 Our first issue of Wild Seed featured an article on Native Fruits by Russ Cohen or check out Russ’s website.